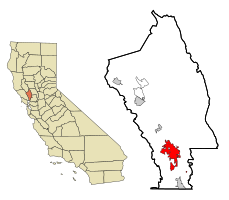 ^ California Cities by Incorporation Date. California Association of Local Agency Formation Commissions. [August 25, 2014]. （原始内容 (Word)存档于2013年2月21日）. ^ City Council. City of Napa. [August 25, 2014]. （原始内容存档于2014年11月6日）. ^ 2010 Census Redistricting Data (Public Law 94-171) Summary File. American FactFinder. United States Census Bureau. [23 May 2012].